Almost ten years after his first cinematic outing, San Diego (It's pronounced "San Di-Aaahgo") newsman, Ron Burgundy, is back. Despite not setting the box office alight, Anchorman gained a sizeable cult following its arrival on home-video - big enough to merit its sequel, which hits cinemas this week. As the seventies come to an end, Ron Burgundy (Will Ferrell) finds himself abruptly fired from his job on Channel 4 News and working at Seaworld. However, he and cohorts Brian Fantana (Paul Rudd), Brick Tamlin (Steve Carell), and Champ Kid (David Koechner) are recruited by up-and-coming 24 hour news channel. After watching Anchorman 2, you may be met with a slight feeling of relief. It's good. After years waiting for this sequel, it is a delight to say that it is on par with the first entry in terms of laughs and downright absurdity. Ferrell and co-writer/director Adam McKay have produced a laugh-a-minute feature that lives up to the comic legacy and "By the hymen of Olivia Newton John!” is as instantly quotable. 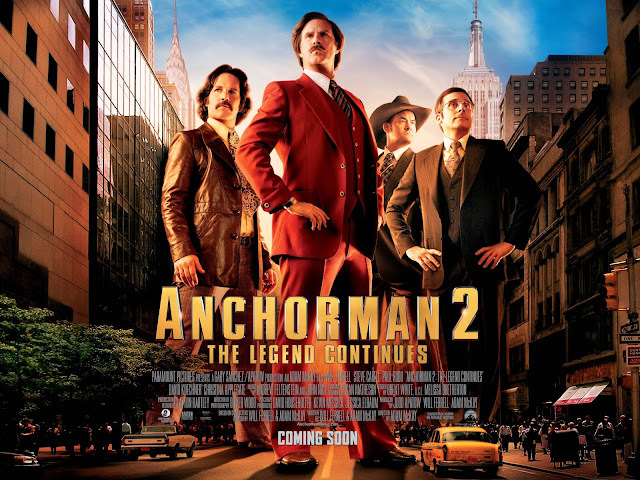 Considering the somewhat lengthy runtime (for a comedy anyway), Anchorman 2 remains steadily amusing throughout. From the onset when we see Burgundy strutting down the streets in a long brown fur coat, it is hard not be amused. Ferrell is an actor who simply knows what is funny and how to get a laugh, with the smallest gesture or expression often being as amusing as one of the well-written gags. It is also refreshing to see that Ferrell does not keep all the good lines for Burgundy, with each supporting character getting the chance to shine, most notably the newsman's colleagues. Rudd is on fine form as Fantana who now unveils his world famous 'jimmy cabinet,' whilst Carell is more outlandish as the now-loved up Brick. The Brick romance is one of the most amusing subplots of Anchorman 2, utilising the fantastic comic skills of Carell and the ever-hilarious Kristen Wiig. Wiig's Chani is essentially the female Brick - someone who can utter lines like "I was thinking about Secret Santa" (in July) and "Your hair looks like wet popcorn" with complete commitment. Wiig is just one of the scene-stealing newcomers: James Marsden, Harrison Ford, and Greg Kinnear all make amusing additions to the cast, whilst previous stars like Christina Applegate are given plenty of opportunities to shine. McKay and Ferrell capture the decadence and aesthetic of the late-seventies/early eighties in a refreshing and ever-amusing style. With a soundtrack featuring Olivia Newton John & ELO's Xanadu, Hot Chocolate's Every1's a Winner, and Christopher Cross's Ride Like the Wind, we are fully transported back to late-seventies New York. Burgundy even takes part in a bizarrely outlandish, wonderfully-dated ice-skating routine at the height of his stardom, which is followed by a laugh out loud moment from one of the film's extras, of which all I will say is: "Don't you dare die in front of us!" There are countless other comic moments that deserve a mention: Burgundy's pet shark Doby, lace-man, on-air crack smoking, Greg Kinnear's mind control, and a cameo-packed conclusion. There is likely to be at least one-gag that does it for you, yet probably more than you can count. Anchorman 2 is a stellar follow-up to its predecessor. Consistently hilarious, well-performed, this is how sequels should be. It's just refreshing.